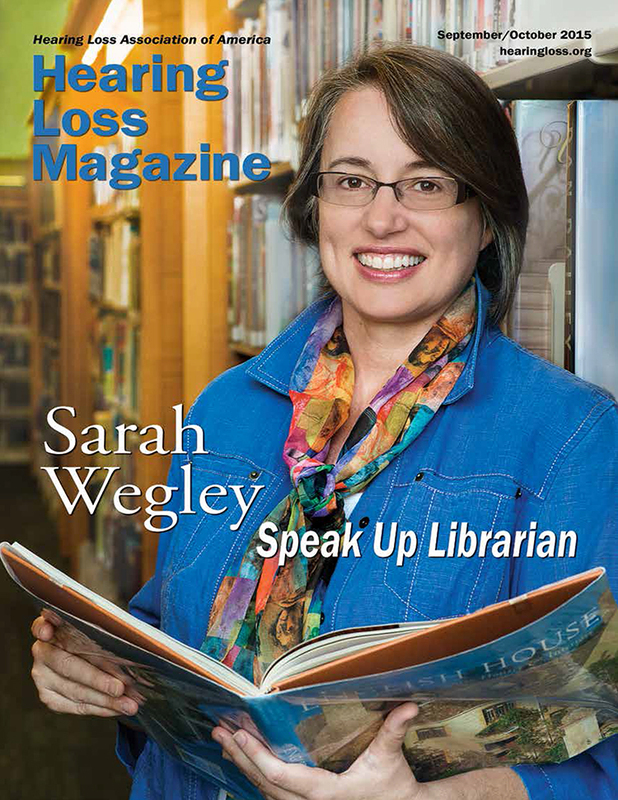 Sarah Wegley graces the cover of the September/October 2015 issue of Hearing Loss Magazine, which is published bimonthly by the Hearing Loss Association of America (HLAA). 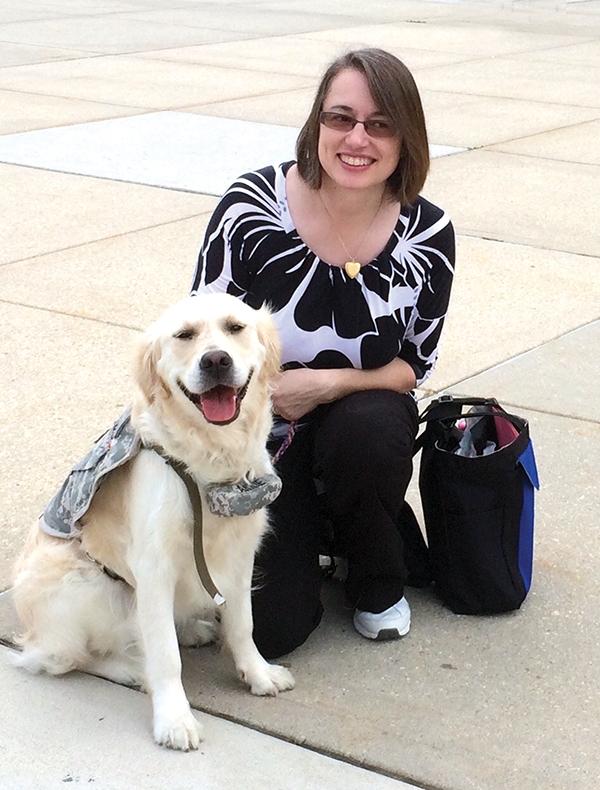 Sarah is a librarian and was a Strategic Communications Intern at HLAA earlier this summer. She recently received her MA in Communications. 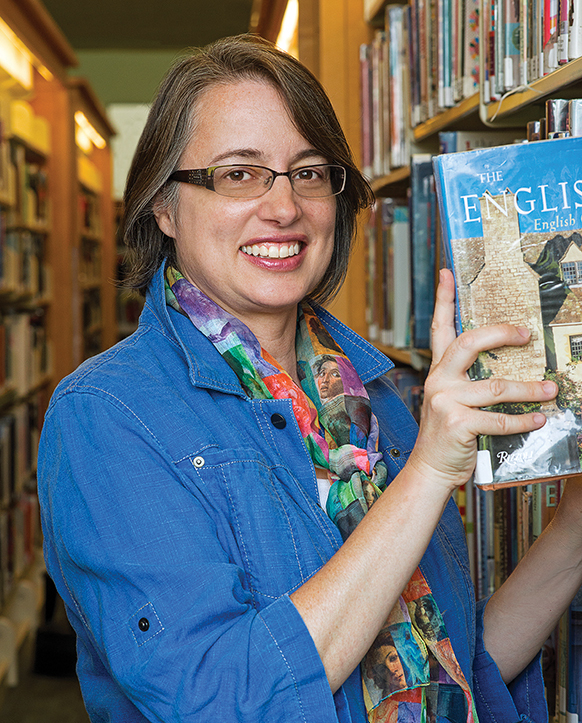 We had a fun photo shoot at a local library in Alexandria for her feature article in this issue. Special thanks to my friend and long-time HLAA volunteer, Hollace Goodman, for assisting on the shoot. Check out Sarah’s blog here: http://speakuplibrarian.blogspot.com. Until nine years ago, I had no idea I had a hearing loss. I assumed the quiet world I knew was the same one everyone experienced. I don’t really know when my hearing started to fade, but my blissful ignorance came to an abrupt end the day I missed an alarm bell ringing at work. Yes, it took a loud and embarrassing wake-up call to get my attention. I was at the library calmly going about my business at the information desk when an emergency exit door on a far wall was opened by accident triggering a steady high-pitched noise. Because the key for turning the alarm off was kept at the information desk, it was up to me to go turn it off, but I didn’t because I could not hear it. After the alarm continued sounding for several minutes, a supervisor came to see what was happening. She did not realize I could not hear the noise. Even worse, I didn’t realize I could not hear the screaming noise! As I walked with her toward the exit door, I began to hear the sound but it wasn’t as jarring and uncomfortable as it had been in the past. Something was wrong. I called an ENT office for an appointment as soon as my desk shift was over. The doctor saw me the next day and ordered a hearing test. When the results showed I had permanent hearing loss and needed hearing aids, I was stunned. How could this be? I was only 40 years old with no family history of hearing loss. Despite my shock, I immediately ordered a pair of hearing aids. There was no doubt in my mind that I wanted to do all I could to hear and continue working. Getting used to my hearing aids and accepting my new identity as a person with hearing loss proved challenging for me. I decided to get a second opinion which is generally a reasonable action to take. In my case I ended up getting undeniable confirmation that I did not hear as well as I thought. However, that knowledge didn’t come from the ENT; it came from my own misadventure. I had never been to this doctor before and was unfamiliar with his waiting room setup. When my name was called at the exact time of my appointment, I was impressed. The nurse called out my first name “Sarah” and when I approached, she remarked, “The doctor’s going to see what the problem is.” That sounded reassuring. Then, she led me into an examining room which looked surprisingly like my optometrist’s. Hmmm, I thought to myself, maybe he has to share his office space because his is being remodeled…. The nurse left the room before I had a chance to ask. Next thing I knew there was a small commotion in the hallway. Even though I wasn’t wearing hearing aids, I could discern someone saying, “You called my name.” Uh-oh. I went out to investigate. I found the nurse speaking with another woman and a doctor. “No, I said Vera,” she replied. Oops. The doctor turned to me and said, “Are you here to see the hearing doctor?” I nodded. Crushed, I returned to the waiting room hoping no one there was aware of my faux pas. As it turned out, the doctor I had come to see was running behind schedule and I was too impatient to wait more than an hour. I told the receptionist untruthfully that I would reschedule my appointment. I couldn’t wait to get out of there! I never returned, choosing instead to stay with my original ENT. After that fiasco, I had to admit to myself I truly had a hearing loss and needed to get on with adjusting to life with hearing aids. I found I had many questions as a new hearing aid wearer. As helpful as my audiologist was, I often felt unsure about things between office visits. I longed to know if what I was experiencing was normal. One of my greatest worries was what the outlook would be for my future. Would I be able to continue working? Would I lose all my hearing within a short time? I didn’t know anyone in the same situation who I could talk to about these concerns. I turned to the Internet to learn more about living with hearing loss. There I discovered people sharing stories and advice on websites, forums, and personal blogs. I began to relax once I found others online who were coping with hearing loss. Eventually, I realized I could not keep what I was learning to myself. As a librarian, I wanted to help others find this information so they would not feel as lost as I did initially. I decided to share the resources I discovered along with my funny hearing mistakes on my own blog. Thus, began my new persona as “Speak Up Librarian, the hard of hearing librarian who will never tell you s-h-h-h.” I had no idea at the time how my blog writing would change my life. At first, all my friends with hearing loss were people I knew online, mainly other bloggers I met through DeafRead (deafread.com). Then, I learned about the Hearing Loss Association of America and found a nearby chapter that hosted their meetings in a library where I used to work. Since I knew right where the place was, there was no excuse for me not to go. Attending my very first meeting I knew I had come to the right place. When I entered the meeting room, the greeter looked directly at me when she spoke. I found a seat next to Julie, a woman around my age who also wore a hearing aid. She and I became friends and discovered we had more in common than hearing loss. Through my involvement with the HLAA Northwest Indiana Chapter, I made more friends and took my first baby steps in advocacy. One of the desires this group had was to increase access to open-captioned films at a local theater. We became inspired to pursue this goal after hosting a chapter meeting with speakers from Fifth Freedom (fifthfreedom.org), a nonprofit organization dedicated to helping disability support groups learn how to make a difference in their local areas. I wrote a letter to the theater manager requesting more showings than the two per month on weeknights that were currently available. I explained that without captions, I missed parts of the movie dialog and that I wanted to be able to attend a film on a weekend with my family. I never received a response to my letter; but that did not deter me from promoting open-captioned movies on my blog and learning about other communication accessible theater options like Rear Window® Captioning and closed-captioning devices. One exciting evening I went into Chicago with my newfound support group friends to see a play. At the theater, we had two captioning options available to us—looking at the script projected onto a side wall or looking down onto a portable closed-captioning device on a stand placed on the floor by your seat. Julie and I took one of the stands and positioned it between our seats so we could try out both options and see which we liked better. Even though it was annoying to have to turn my head to see the words on the wall, I found I could not stop reading them. I told myself the volume was loud enough that I could just watch the action on stage but I found myself watching the words nonetheless. It was so much easier than having to listen and figure out what was said! I didn’t like reading the much smaller print on the portable device and its brightness level also bothered me. However, Julie preferred this captioning option so I was glad we had given it a try. This experience and others with captioning at live performances and the movies reinforced for me what a difference it made to my enjoyment of theater when I was able to read the dialog and understand what was being said. A few years later, I took my advocacy efforts to a higher level. In 2012, I spearheaded a national campaign called Show Us the Captions to educate people about the new closed-captioning equipment (Sony’s Entertainment Access Glasses and the Dolby CaptiView Closed Caption Viewing System) available at movie theaters. My big idea was along the lines of the Great American Smoke-out sponsored by the American Cancer Society: What would happen if people all over the United States with hearing loss went out to the movies on the same day and requested communication access? A. Use the devices that had been acquired. B. Show the theater staff what the faces of hearing loss look like. C. Express appreciation for the improved accessibility. I chose to plan the event for a date in November, a month with a holiday associated with thankfulness and spending time with family and friends. The first cinema I chose for the project was located a 30-minute drive from my home. This was because when I started the campaign I had no idea that my own neighborhood theater had CaptiView devices available. Once I learned this I realized the word was not getting out to the public if someone as informed on the subject as I was had not known this. I became even more motivated to spread the news. To make my Show Us the Captions event a national one, I partnered with Lauren E. Storck, Ph.D., of Collaborative for Communication Access via Captioning (ccacaptioning.org). Together, we worked at getting individuals and organizations across America involved. I created a Facebook page, flyers, a slideshow, a publicity website, and a Google map showing participating theaters. Lauren posted updates on the CCAC website and our Show Us the Captions Facebook page. Both of us answered many emails from people who were interested in joining us. Over time we expanded the idea from people coming out on a single day to any time during the month of November so we could increase the number of people involved. One group even used the first week of December. Within the Chicagoland area, I organized six locations for November 17, 2012, with the help and support of the Association of Late-Deafened Adults Chicago Chapter and the HLAA Lincoln Park Chapter. Ultimately, Show Us the Captions had participation in the United States from California, Colorado, Florida, Illinois, Indiana, Kansas, Massachusetts, Michigan, Missouri, Pennsylvania, Texas, Utah, Vermont, and Virginia. Because CCAC is an international organization, we also had people join in from France, England, and Australia. Hundreds of people engaged with this advocacy campaign! This fascinated me so much I wrote my first graduate school research paper on the potential of websites and social media for nonprofit organizations’ advocacy communication. Concurrent with my work on Show Us the Captions, I had started graduate school at the university where I worked. I became inspired to go back for a master’s degree in communication studies after reading Bruno Kahne’s Lessons of Silence. In this article, Kahne describes his unique training program that uses people who are deaf to teach corporate executives how to communicate more effectively. They don’t do this by learning sign language. Instead, Kahne and his trainers teach better interaction behaviors that are common in Deaf culture. After reading about Kahne’s work, I realized the significance of the behavioral changes I had made and continue to make as I face communication challenges on a daily basis. I began to consider how experiencing hearing loss had made me become a more attentive and strategic listener. For example, if I am going to a work meeting, I make sure to arrive early so I can figure out the best seat for acoustics. For a lecture this is often a front row seat directly in front of the speaker; but in a small group session, it might be sitting closest to the person who called the meeting or next to the person with the softest voice. Reading the script of a play in advance is another habit that helps my comprehension. When traveling, I prepare myself for new situations by looking at websites to familiarize myself with background information. This makes me feel more comfortable knowing what I can expect when I arrive. When communicating interpersonally, I have learned that most people speak on subjects important to themselves. I need to be cognizant of this because my brain will often make hearing mistakes if I assume people are talking about what is uppermost in my mind at the time. Here are a few examples of my mishearing: fat and accurate instead of fast and accurate, bad eggs instead of mayonnaise, and A-bomb instead of Avon. For a listener with hearing loss, it’s easy for a conversation to go astray. By returning to school, I hoped to further my knowledge of communication dynamics as well as to hone my writing and speaking skills so I could be a more effective advocate. This past semester, I combined these interests when I created a workshop on “How to Communicate Effectively with Adults Who Have Hearing Loss” for my Communication Training class. One of my primary goals was for participants to experience what hearing loss sounds like. I thought this could increase their understanding of the listening challenges involved. On the day of my presentation, I had a great turnout with 19 people attending. My target audience was hearing people and eight of my attendees were friends and family members of people with hearing loss. Because CART was provided, their loved ones with hearing loss could attend with them. Feedback from the participants showed their workshop experience had been meaningful and helpful which made all the work I had put into developing it worthwhile. 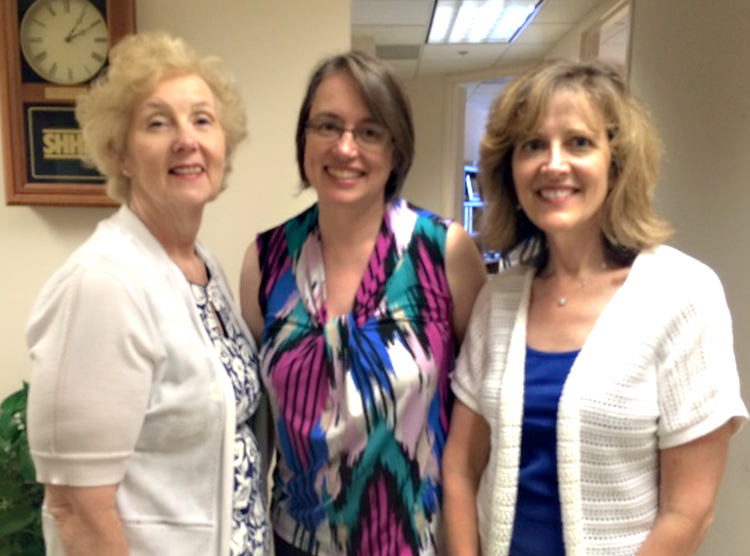 This summer I had the marvelous opportunity of volunteering at the HLAA office in Bethesda, Maryland, as a communications intern. I will receive six hours of college credit upon my completion of 180 hours of service, submission of a comprehensive internship report, and presentation to my peers and professors. HLAA does not have an official internship program in place, but I made arrangements with Executive Director Anna Gilmore Hall for working there when I attended Convention 2014 in Austin. I’m glad I made that request because my experience in the Washington, D.C. area has been an incredibly enriching one. In addition to my daily work of copy editing, writing, and researching, I participated in a staff meeting where Convention 2015 was reviewed. I also had some enjoyable times outside the office touring Gallaudet University with HLAA staff member Lisa Devlin; making a pilgrimage to the Library of Congress with HLAA volunteer Hollace Goodman, visiting Walter Reed National Military Medical Center where I met military therapy dogs, Annie and Archie; and attending two celebrations of the 25th anniversary of the signing of the Americans with Disabilities Act (ADA). Sarah Wegley, M.L.S., is a library operations associate for Digital Metadata and Web Services at Governors State University. 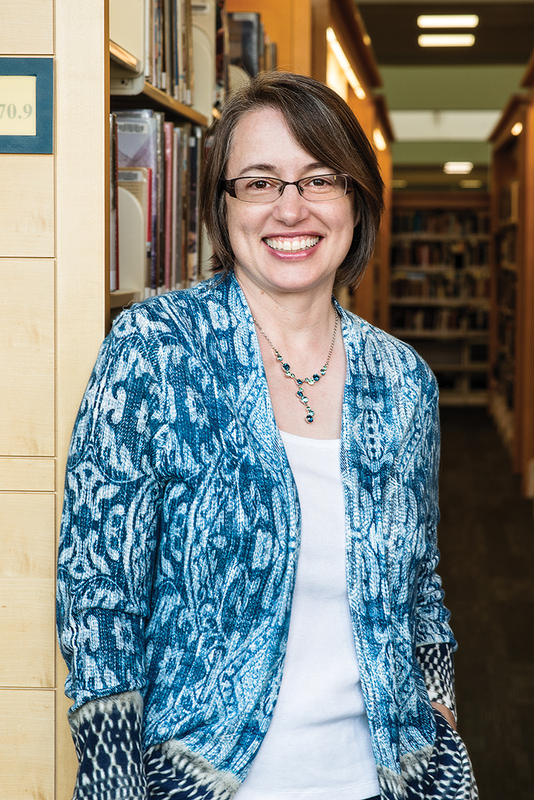 She is responsible for management of the university repository, digital collections, library website, and library portal site. She has a master’s degree in Library Science from Indiana University and expects to complete her second master’s degree in Communication Studies in spring 2016. She lives in Chicago Heights, Illinois, with her husband, Rob, and two golden retrievers, Blondie and Melody. They have one son, Charlie, who is serving in the military. Sarah has been writing about hearing loss since 2006 on her blog, Speak Up Librarian. Contact her by email at speakuplibrarian@yahoo.com. 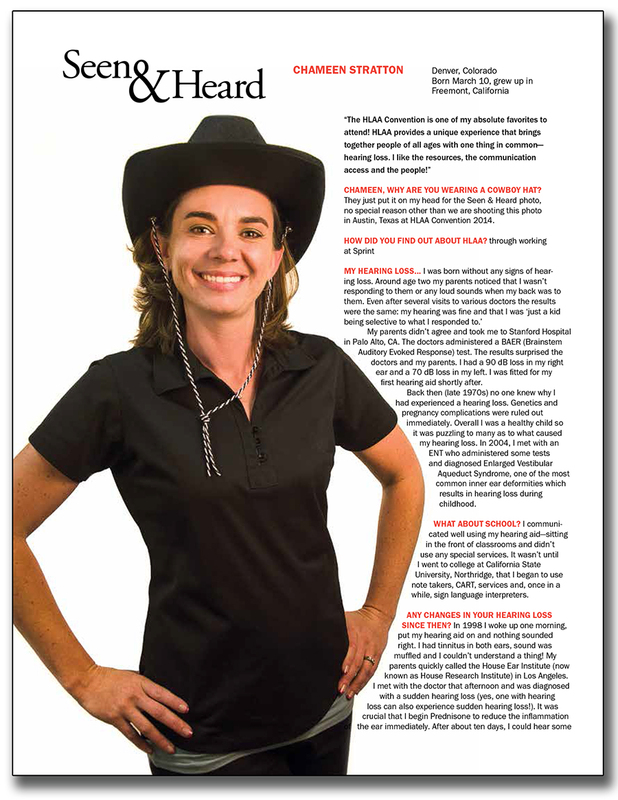 Chameen Stratton is our Seen & Heard profile in the September/October issue of Hearing Loss Magazine, which I design bimonthly for the Hearing Loss Association of America (HLAA). I photographed Chameen at Convention 2014 in Austin, TX. CHAMEEN, WHY ARE YOU WEARING A COWBOY HAT? They just put it on my head for the Seen & Heard photo, no special reason other than we are shooting this photo in Austin, Texas at HLAA Convention 2014. MY HEARING LOSS… I was born without any signs of hearing loss. Around age two my parents noticed that I wasn’t responding to them or any loud sounds when my back was to them. Even after several visits to various doctors the results were the same: my hearing was fine and that I was ‘just a kid being selective to what I responded to.’ My parents didn’t agree and took me to Stanford Hospital in Palo Alto, CA. The doctors administered a BAER (Brainstem Auditory Evoked Response) test. The results surprised the doctors and my parents. I had a 90 dB loss in my right ear and a 70 dB loss in my left. I was fitted for my first hearing aid shortly after. Back then (late 1970s) no one knew why I had experienced a hearing loss. Genetics and pregnancy complications were ruled out immediately. Overall I was a healthy child so it was puzzling to many as to what caused my hearing loss. In 2004, I met with an ENT who administered some tests and diagnosed Enlarged Vestibular Aqueduct Syndrome, one of the most common inner ear deformities which results in hearing loss during childhood. WHAT ABOUT SCHOOL? I communicated well using my hearing aid—sitting in the front of classrooms and didn’t use any special services. It wasn’t until I went to college at California State University, Northridge, that I began to use note takers, CART, services and, once in a while, sign language interpreters. ANY CHANGES IN YOUR HEARING LOSS SINCE THEN? In 1998 I woke up one morning, put my hearing aid on and nothing sounded right. I had tinnitus in both ears, sound was muffled and I couldn’t understand a thing! My parents quickly called the House Ear Institute (now known as House Research Institute) in Los Angeles. I met with the doctor that afternoon and was diagnosed with a sudden hearing loss (yes, one with hearing loss can also experience sudden hearing loss!). It was crucial that I begin Prednisone to reduce the inflammation of the ear immediately. After about ten days, I could hear some sounds again with my hearing aid and, by the time I was done with the medication, my hearing was restored back to its ‘before’ state. Since then, I’ve had eight episodes of sudden hearing loss and each time I must get to an ENT doctor within 24 hours to get medication. After the medication my hearing has been restored each time. Today my hearing loss is stable. DISADVANTAGES OF A HEARING LOSS… It confuses people. I can hear well enough to have a conversation in most environments and I speak well. As a result, many people forget that I have a hearing loss which causes frustrations, many misunderstandings and a lot of assumptions! ADVANTAGES OF A HEARING LOSS… peace and quiet when I take out my hearing aid! FAVORITE CHILDHOOD MEMORY… babysitting. I loved the Babysitters Club books and actually started up a similar business with a few good friends. Parents would call me and let me know the date/time/location they needed a sitter. If I couldn’t take the job, I would reach out to five others to find a babysitter who could work at that time and then report back to the parent on who was assigned to that job. It was a one-phone-call-away approach to finding a babysitter. The parents LOVED it! A YOUNG ENTREPRENEUR, WHAT ELSE? Each of us babysitters had a Babysitters Kit that we’d always take to our assignments. The kit was filled with various activities, simple toys and a stopwatch (because every kid knows that other kids’ toys are a lot more fun than their own!). Just before parents would arrive home from their outing, we would pull out our stopwatch and document how fast the kids cleaned up the play area. The next time we were asked to babysit, we’d encourage them to beat their previous times. The parents loved this (clean house), the kids loved this (a challenge) and we loved it too (being called back to babysit again). I LOVE THE SOUNDS OF… my kids’ giggles and laughter, music, the ocean. IN MY SPARE TIME, I… spend as much time as I can with my kids and husband outside hiking, running around and enjoying all that Colorado has to offer! When not with the family, I love creating photo albums to preserve all the amazing moments in life! I MOST DEFINITELY AM NOT… shy. HAPPINESS IS… being surrounded by family and friends! WHO HAS HAD THE MOST INFLUENCE IN YOUR LIFE? My mom. She’s always been my rock, my role model and best friend. CITY, BEACH, COUNTRY OR MOUNTAINS? All of the above! That’s one of the best things about Denver—we get three out of the four all within driving distance. I COLLECT… memories. From photographs to keepsakes, I enjoy preserving my family’s moments in albums for future generations to see. HIGH SCHOOL JOB… stage crew for the Mega-Mess-a-Mania Show at Paramount’s Great America Theme Park. I got to dump slime on contestant’s heads and throw whipped cream pies in their faces. ANY JOBS IN COLLEGE? I worked for the National Center on Deafness, California State University, Northridge. I researched and wrote sections of curriculum. JOBS AFTER COLLEGE? marketing manager for Sprint Relay/Sprint CapTel and program manager for Wyoming and South Dakota Relay Services. I started as an administrative assistant and have been with them for 12 years—an amazing journey! I AM… adventurous, energetic, and sympathetic. MY KIDS HAVE TAUGHT ME… the meaning of patience and how to see the world through a child’s eyes! MY MOTHER TAUGHT ME… about the bond of a family and how to cherish every moment. WHAT’S THE BEST THING SINCE SLICED BREAD? Sprint CapTel Services and having access to everything in the palm of your hand (smartphones). I SIMPLY CANNOT LIVE WITHOUT… my amazing circle of family and friends. RIGHT NOW I AM CRAVING… a good hike in the mountains! WHAT IS YOUR GREATEST ACCOMPLISHMENT?… my kids (both birth and stepchildren). They are growing up to be such amazing people!